This is a great dessert for a special dinner as it can be made early on in the day and left to set in the fridge. Just peel away the paper before you serve them. If you would like to decorate the soufflés, add a few tiny blackberries and mint leaves to the top or dust lightly with a little sifted icing sugar at the very last minute. 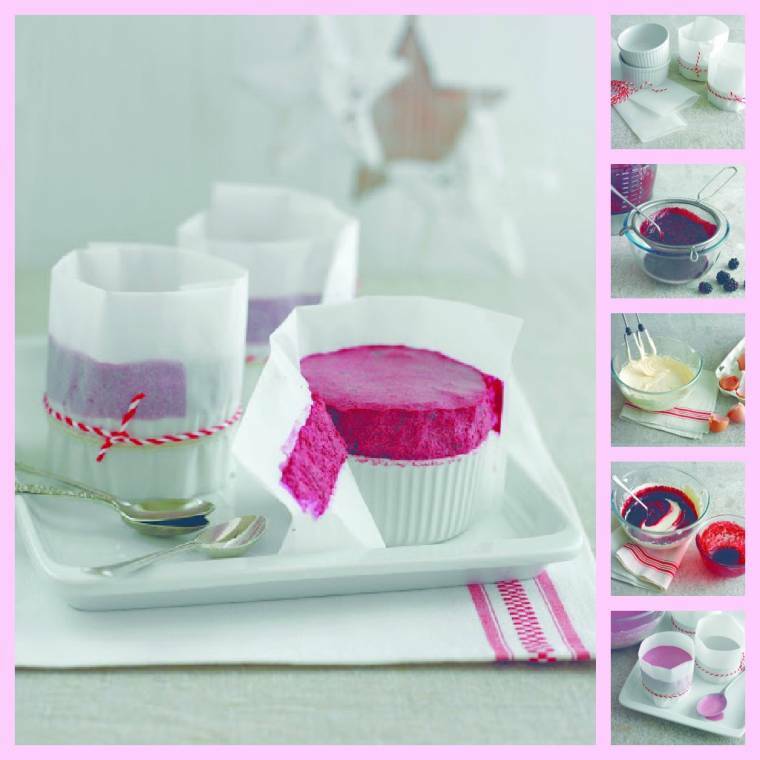 Wrap 6, 125ml (4fl oz) individual soufflé dishes with a double strip of non-stick baking paper so that the paper encircles the dishes completely and is about 4cm (11/2inch) above the top of each dish and tie with string. Add the blackberries to a saucepan with 2 tbsp water, cover and cook gently for 5 minutes then puree in a food processor or liquidiser until smooth. Press through a sieve to discard the seeds. Meanwhile add the remaining water to a small heatproof bowl, sprinkle the gelatine over the surface making sure that all the dry specks of gelatine are absorbed by the water. Leave to soak for 5 minutes then put the bowl in a small saucepan of gently simmering water and heat for about 5 minutes until the gelatine has dissolved and become a clear liquid. 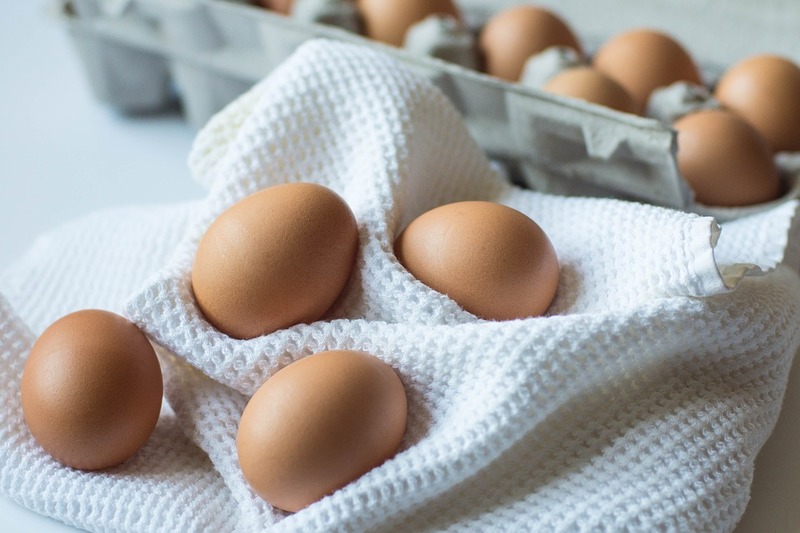 Add the egg yolks and sugar to a large heatproof mixing bowl set this over a saucepan of gently simmering water and using an electric mixer, whisk the eggs and sugar together until very thick and pale, this should take about 10 minutes. To test remove the bowl from the pan and lift the whisk above the mixture it should leave a ribbon like trail that stays on the surface for a few seconds. If your electric whisk is on a fixed stand this will work just as well but will just take a few more minutes to get the mixture really thick. Gradually trickle the dissolved gelatine into the egg yolk mixture in a thin steady stream as you fold it in with a large metal spoon. Add the blackberry puree and gently fold into the egg yolk mixture. Wash and dry the whisk carefully then whisk the egg whites in a second large bowl until they form moist looking peaks. Using the still dirty whisk, whip the cream in a second smaller bowl until it forms soft swirls. Fold the cream into the blackberry mixture, then gently fold in a spoonful of the egg whites to loosen the mixture. Add the remaining egg whites and chopped mint and gently fold together. Pour or spoon the mixture into the lined dishes so that the soufflé mixture is above the top of the dishes but contained within the paper collar. Chill for 4 hours or until set. To serve, remove the string then loosen the paper and peel away using a small sharp knife. Stand the dishes on small plates or a tray and decorate with extra blackberries and tiny mint leaves. Serve immediately. Matalan Autumn/Winter Ditsy Floral Dining…. "Roast Poussin With Blackberry Cumberland Sauce …"
I love the colour of those souffles. I have some blackberries left over in the freezer, and these sound nice and easy. You have berries over there that can make wonderful desserts etc. Clairejustine! Looks great!